Happy Little Bento: Summer Rolls Bento, part 3. 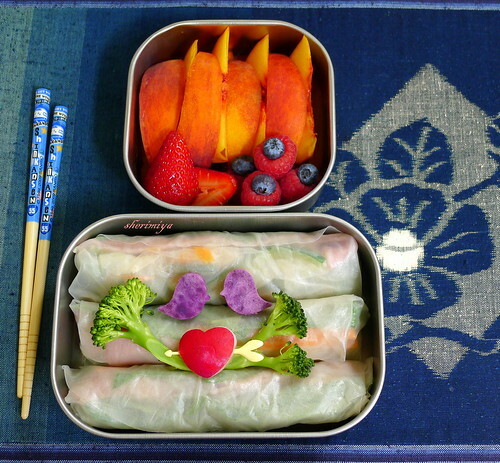 Summer Rolls Bento, part 3., a photo by sherimiya ♥ on Flickr. We just came off a long 3-day weekend due to a teachers work day, and it's a little tough to get back into bentomaking and blogging again. And did I mention the whole weekend was the most gorgeous, summery, sparkling weekend we've had all year?! That's right; we hit our year's high temperature yesterday. The bay area is notorious for cool summers and late warming, so this is pretty typical. While everyone else is planning pumpkin soups and pot roasts, we're thinking refreshing salads and ice teas. So here's today's no-cook bento: the ever-popular summer rolls in rice paper wraps, filled with lettuce, pickled carrots and cucumbers, deli nitrate-free ham and salami. Yeah, I know it sounds weird. But the kiddos cannot get enough. Plus, the rice wraps stay closed so well (compared to tortillas) that they're hard to beat mess-free fun finger foods. How can you argue with that? Two little Okinawan sweet potato lovebirds perch upon a broccoli branch above a radish heart. Awwwwww. Summery peaches and berries complete the meal. I wonder if they'll go for summer rolls all week?